Interested in insulating your crawl space? Think this damp space is isolated and doesn’t affect the interior of your home? Think again. The natural airflow of a home is from bottom to top (ground to sky). As your home naturally breathes, the moist air (and everything in it) flows up and into the living areas of the home. Creating a consistent temperature in a crawl space helps maintain a consistent temperature in the home. 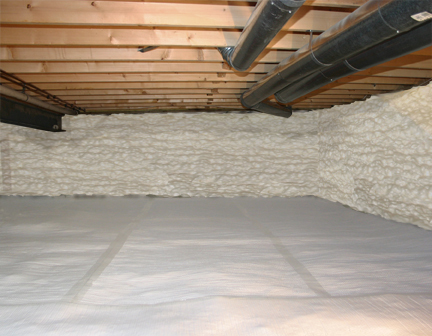 Installing spray foam insulation in a crawl space also creates an additional air barrier, preventing unhealthy air from leaving the crawl space and entering the home. 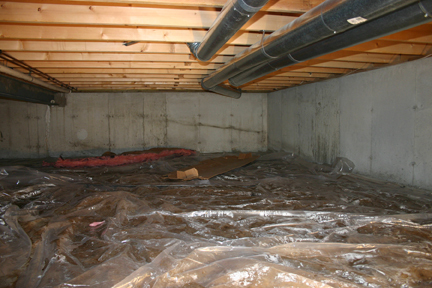 Once a crawl space is insulated and encapsulated, the crawl space can be used for storage for the home as well. Contact us with any questions you have on crawl space insulation and crawl space encapsulation, and to schedule a time for a free estimate.